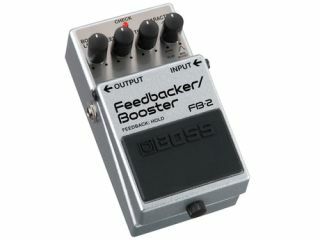 PRESS RELEASE: Boss is pleased to announce the powerful FB-2 Feedbacker/Booster, the latest addition to its famous lineup of compact pedals. Combining an adjustable tone/gain boost with the ability to kick in a natural cranked-amp feedback sound at will, the FB-2 is a unique stompbox that gives guitarists a world of new expressive possibilities. Booster pedals have become extremely popular with guitar players in recent years. Many different types are available, ranging from straight-up gain boosters to tone enhancers that boost treble or midrange frequencies. Using the latest Boss technology, the FB-2 incorporates the most sought-after booster types - as well as their unique sound characteristics and sensitivity to playing dynamics - all in one convenient and affordable pedal. The intuitive character knob allows for variable adjustment over the tonality of the FB-2's boost function. The counter-clockwise position provides a flat, clean boost that doesn't change your tone. As it's moved towards the centre position, the low is cut off and mids start to lift up gradually. Cranking the knob higher boosts mids while decreasing the treble, delivering fat tones which are perfect for solo playing. Additional sound-shaping controls include boost level and tone. For instance, twisting the tone knob higher at the lower position of the character knob provides treble boost for presence and shimmer. But boost is only half the story - the FB-2 also provides the dynamic, responsive tone of natural guitar amp feedback in a stompbox. Traditional guitar feedback occurs when the amplifier is turned up loud enough to interact with the guitar's string vibrations. The resulting feedback gives a warm expressive sustain, but requires loud volumes and careful physical interaction with the amp's speakers. The FB-2 gives players instant access to feedback at any volume simply by holding the pedal's footswitch, thereby providing smooth and natural feedback. It is noteworthy that the feedback is authentic and true, not an artificial, oscillator-driven sound. The FB-2 creates natural, authentic feedback on the note that you play without the unwanted squealing. Additionally, the feedback knob adjusts the time taken to boost the point of frequency to feedback. The FB-2 Feedbacker/Booster will be available in November with a street price of £85. Information taken from official press release, for more visit Roland.